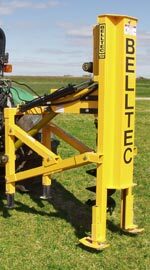 Belltec Industries TM48 Post Hole Digger mounts easily on three-point tractors with over 28 horsepower which have at least two hydraulic remote valves. Our machine’s design and performance go way beyond today’s tractor mounted post hole diggers. The unique system transforms a three-point tractor into a drilling machine capable of doing what the big truck rigs do: drill accurate, straight holes (to a depth of 5 ft on a single auger) in almost any drilling condition, including solid rock and concrete. For use with Extra Heavy Duty Dirt Augers. 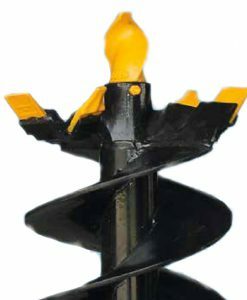 Extra heavy duty dirt augers for drilling dirt, clay and fractured rock. 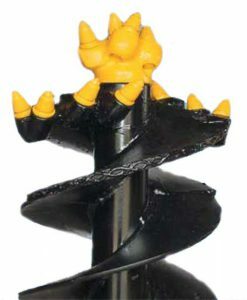 TM48 Extra Heavy Duty Cast Head Augers 4.5 to 18 in Dia.